Pete Vallee and Wild Bill Ervin have been working together for six years. In 2004, Elvis fan Kathy Elkins visited Las Vegas from Florida. On the cab ride from the airport, she asked the cab driver who was the best Elvis impersonator in town. “Do you want an Elvis look-alike or a great Elvis voice?” answered the cab driver. Elkins said she wanted the voice. The cab driver told Kathy to visit a show by a man known simply as Big Elvis. Elkins has come to Las Vegas once a year for a week every year since 2004 and during every trip she has seen as many Big Elvis (Pete Vallee) shows as she could. Last Wednesday, I met her during the second of the three shows she was seeing at the Harrah’s Las Vegas Piano Bar. Yep, Elkins loved Pete Vallee’s voice and found the singer to be personable as well. 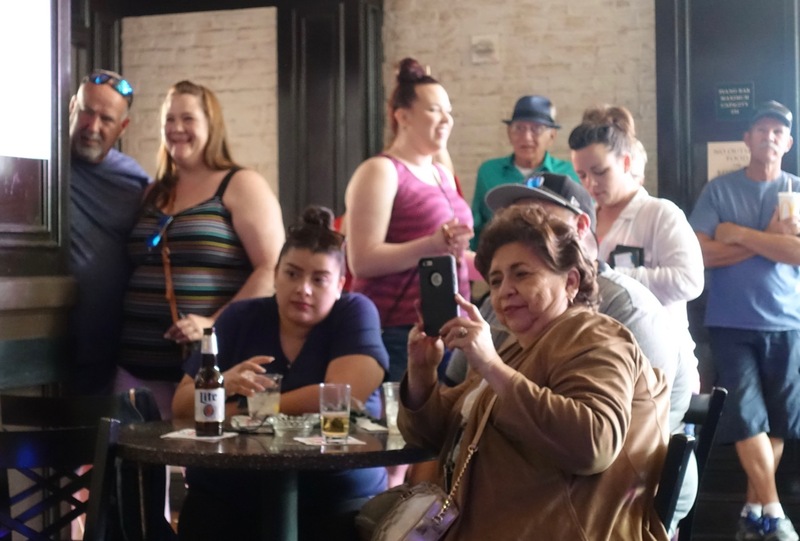 She arrives early at Big Elvis shows to get a front-row seat. Me? I was seeing my first Big Elvis show, having known about him, but never having taken the time to see him perform. Pete Vallee has been performing since the age of 5. He was born and raised in Tennessee and at age 15 came to Las Vegas with his mother who was a singer. She wanted work AND she wanted to give her son the opportunity to be heard as a singer. As the Big Elvis show progresses, folks crowd in all the corners just to see (and photograph) Pete Vallee. Vallee today is 54 years old and has been performing in various Las Vegas locations for 40 years. At Harrah’s, his sidekick is a friend of mine, “Wild bill” Ervin. 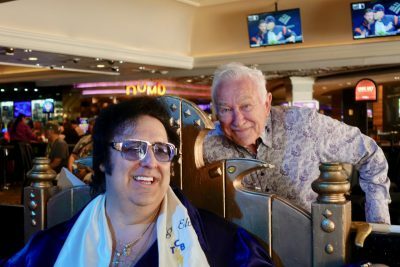 Ervin says he and his wife were regular Vegas visitors for years; Ervin, exploring the city, came across a Big Elvis show, became a fan, got to know the artist and ultimately became a good friend as well. When Ervin’s wife died, Vallee asked him to pack his bags and move to Las Vegas permanently to help him with his shows. Ervin moved and says now, he can’t wait for show days. Ervin is also quite the entertainer himself during Vallee’s songs, playing air guitar and air trumpet and dancing as well. Ervin also sets up the room and handles the sale of souvenir items (CDs, t-shirts, etc.) after the show. Throughout most of his show, the 6’2″ Vallee, sporting pitch black hair, several necklaces and rings, a white satin scarf and a shiny oversized shirt, sits in a large gold chair. He sings to tracks located by the third member of his team, Brad Jarvis. Every now and then, Valley stands and shimmies, sending his shiny shirt in multiple directions. Vallee’s main “gig” is at Harrah’s, but he also performs at private parties as he was scheduled to do the following Sunday. Most, but not all, of Vallee’s repertoire is from the Elvis songbook, but songs made famous by Louis Armstrong, Johnny Cash and others are in the mix as well. Vallee says he never tires of Elvis songs when he sees how much fun people are having just hearing them. Vallee goes home to an acre-and-a-half property in Pahrump, Nevada. He has two grown children, a son and a daughter, neither of whom were interested in the entertainment business. As you will note in the attached video, Pete Vallee smiles a lot, interacts with his audience and in his natural voice sounds a great deal like the original Elvis. Folks leaving the show can’t help but have an extra pep in their step. Thanks for the story. I haven’t seen him in several years but I’ve always enjoyed listening to him.